At North Bridge Inn, we are dedicated to protecting your privacy and safeguarding your personally identifiable information. Our main purpose in collecting your personal information is to provide you with a streamlined experience in making reservations at North Bridge Inn. We only collect information about you that we consider necessary for achieving this. Personally identifiable information is only obtained when making a reservation. All identifiable information provided will not be disclosed to anyone unless we are specifically requested to do so. North Bridge Inn does not give or sell to anyone any information we collect on our site. At North Bridge Inn, we take security seriously. When users make a reservation we use every precaution to safe guard it online and offline. North Bridge Inn may amend this Privacy Statement from time to time in order to meet changes in the regulatory environment, business needs, or to satisfy the needs of our guests, properties, strategic marketing partners, and service providers. Concord is a town northwest of Boston, Massachusetts. It’s known for the American Revolutionary War sites in Minute Man National Historical Park. A key battle took place at the North Bridge and is commemorated by Daniel Chester French’s Minute Man statue. In the 1800s, Transcendentalist poet Ralph Waldo Emerson drafted his essay “Nature” at the Old Manse. He and writer Henry David Thoreau also frequented Walden Pond. Walden Pond State Reservation offers swimming, canoeing and wooded trails. 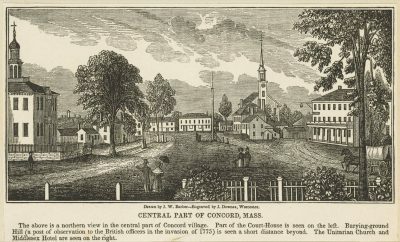 Concord’s literary landmarks include The Wayside, a colonial house that was home, sequentially, to writers Louisa May Alcott, Nathaniel Hawthorne and Margaret Sidney. Alcott later lived in adjacent Orchard House, which inspired the setting of her book “Little Women” and retains many family furnishings. The graves of Hawthorne, Alcott, Emerson and Thoreau are at Authors Ridge, in Sleepy Hollow Cemetery. Literary and Revolutionary War artifacts are on display at the Concord Museum. The town center, with its quaint Main Street, is known for its restaurants. Concord is a year-round destination. A popular time to visit is during the warm summer months (Jun–Aug) for outdoor activities like hiking, canoeing and swimming. Vivid foliage draws visitors in fall (Oct–early Nov). Winter (Dec–Feb) is cold and often snowy. Patriots’ Day (Apr) marks the first battles of the American Revolution with Minute Men marches and re-enactments in Concord and neighboring Lexington. Some historic sites, like The Wayside, are open only in the warmer months (varies) and/or a few days of the week.